The Chinese pilgrim Hiuen Chuang (830 A.D.) saw images that had sunk into the damp Indian soil, and was told local prophecies to the effect that thereligion of the Teacher would vanish completely when the image had sunk out of sight altogether. Shashanka, king of Bengal who had systematically destroyed Buddhist religious structures, cut down and burned the sacred tree at Gaya under which the Buddha had attained enlightenment twelve centuries earlier. The tree was soon nursed back to growth from a sprout discovered by Purnavarman, the last descendant of Ashoka. Harsha repulsed Shashanka, restored the devastated Buddhist foundations, and built many new ones. Monasteries by the thousand still housed and fed a vast army of monk. 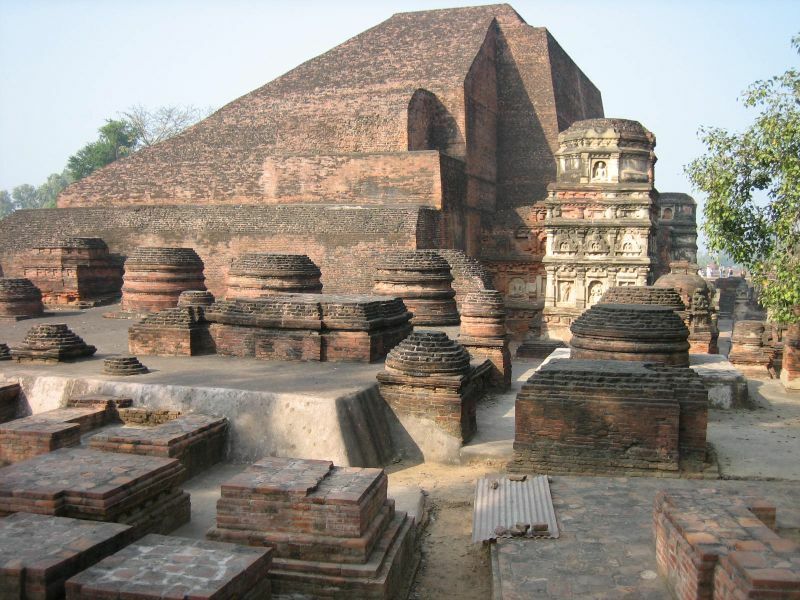 The richly endowed University of Nalanda was at the zenith of its fame. All seemed well. This was surely not the way merit had been judged in the days of the Buddha. The original function of the ever-wandering almsmen had been to explain the way of righteousness to all, in the simplest possible words, and the languages of the common people. The new class of disputatious residents of wealthy monasteries cared nothing for the villagers whose surplus product maintained them in luxury. The original rules laid dorm and followed by the Buddha had permitted only the mendicant's trifling possessions without even the touch of gold, silver or ornaments. The Buddhas of Ajanta are depicted wearing jewelled crowns, or seated upon the costliest thrones. Similarly, the old Buddhism had turned Ashoka away from war to the path of peace. His edicts state that the army would henceforth be used only for spectacles and parades. The devout emperor Harsha, on the other hand, managed to reconcile war with Buddhism just as he reconciled hip worship of the Sun god and Maheshwar. Harsha's army increased during thirty years of constant, aggressive warfare, to 64000 elephants, 104000 cavalry, and a still larger number of foot soldiers. He was Buddhist enough to forgive the assassin whom he had disarmed, when the assembled kings and nobles demanded the death punishment. The common people, who had to pay for his wars and for the triumphal pageantry, might have preferred his putting the assassin to death and idling less people on fewer battlefields. In a word, Buddhism had become uneconomic. The innumerable monasteries and their pampered inmates were a counterpart of the costly military establishment. Buddhism had, from the very beginning, favored the growth of a universal monarchy, which would stop petty warfare. The Buddha is chakkravartin, spiritual counterpart of the emperor. But such great, personally administered empires had themselves become uneconomic; Harsha's was about the last of the sort in India. Thereafter, kingdoms were much smaller till feudalism from below gave the state a new basis of feudal landowners. The administration gradually drifted into the hands of a feudal hierarchy growing from below with new (feudal) property rights in land. The village defeated both the empire and the organized religion that accompanied it. The self-contained village was hereafter the norm of production. Taxes had to be collected in kind, and consumed locally, for there was not enough trade to allow their conversion into cash. Transport of grain and raw material over long distances would have been most difficult under medieval Indian conditions. Harsha traveled constantly with court and army, through his extensive domains. The Chinese pilgrim states that Indians rarely used coins for trade, which was conducted by barter. This seems confirmed by the absence of coins struck by Harsha, which contrasts with the tremendous hoards of punch-merited coins that had circulated under the Mauryans. Buddhism owed its initial success precisely to its fulfillment of a great social need. Society in the Gangetic basin of the 8th century B.C. was not organized into peaceful villagers producing mostly for themselves. The much thinner population was divided into a set of warring semi-tribal principalities and some tribes not yet on the level of agrarian production with the plough. Vedic Brahminism and tribal cults were fit only for the pastoral tribe at war with all neighbors. The Vedic animal sacrifices were far too onerous for a developing agrarian economy. The thin pre-Mauryan settlement required trade in metals, salt, and cloth over long distances, which could not be conducted without the protection of a powerful state. The passage from a group of tribes to a universal society, therefore, needed a new social philosophy. That the universal monarchy and the religion of the universal society were parallel is proved by the rise of both in Magadha, at about the same time. Not only Buddhism, but also numerous other contemporary Magadhan sects preached about the same thing: the Jains, Ajivikas, and others all denied the validity of Vedic sacrifice, and the need for killing. Buddhism accompanied and protected the first traders into wild country, peopled by savage tribes. This is shown by the ancient monuments at Junnar, Karle, Nasik, Ajanta, and elsewhere on the junctions of primitive trade routes. The major civilizing function of Buddhism had ended by the seventh century A.D. The ahimsa doctrine was universally admitted, if not practiced. Vedic sacrifices had been abandoned except by some rare princeling whose revivalist attempt had little effect upon the general economy. The new problem was to induce docility in the village cultivators, without an excessive use of force. This was done by religion, but not by Buddhism The class structure in the villages appeared as caste, always scorned by the Buddhists. Primitive tribesmen were enrolled as new castes. Both tribesman and peasant relied heavily upon ritual, which the Buddhist monk was forbidden to practice; ritual remained a monopoly of the Brahmin. Moreover, the Brahmin at that time was a pioneer who could stimulate production, for he had a good working calendar for predicting the times of ploughing, sowing, and harvest. He knew something of new crops, and trade possibilities. He was not a drain upon production as had been his sacrificing ancestors, or the large Buddhist monasteries. A compromise could also be affected by making the Buddha an avatara of Vishnu. So formal Buddhism inevitably faded away. Its main lesson need never be lost: that good thoughts require cultivation and training of the mind by the individual's personal efforts, no less carefully than good singing that of the voice or craftsmanship that of the hand. The value of the thoughts, on the other hand, is to be judged by the social advance, which they encourage. Author's Note: From the Times of India, May 24, 1956, by kind permission of the editor; the title has been changed from “Buddhism in history” and minor corrections made. The topic may be pursued further, by those interested, in my book: Introduction to the Study of Indian History (Bombay, 1956).